Small hexagonal vase in excellent condition. Pretty little vase with rural scene around the body. Probably the vase from a toilet set. Backstamp: Adams WA & Co Est 1637 Cattle Scenery Ironstone. Some blue smudging and wear to the rim and discolouration inside to the base. Lovely rural scene all around the body of this vase. Backstamp: Adams Est 1657 W A & Co Cattle Scenery England. Light all over crazing otherwise excellent condition. Very pretty little vase printed in light steely blue. Probably the vase from a toilet set. Backstamp: Adams WA & Co Est 1637 Cattle Scenery Ironstone. Excellent condition. Straight sided cylindrical vase with gently flared rim. Lovely rural scene around the body and flower border around the inside rim. Backstamp: Adams Estd 1657 WA & Co Ironstone Cattle Scenery. Light crazing with a little discolouration inside and a little wear under the foot. Overall very good. 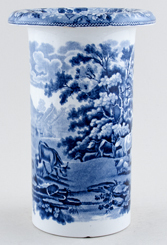 Gorgeous vase with rolled rim and lovely rural scene of cows, sheep, donkey and goat all printed in a steely blue. This is quite a sturdy piece and were it a little taller would make a fabulous umbrella stand. No backstamp. There are two areas of damage under the foot both of which just peek through otherwise excellent condition. 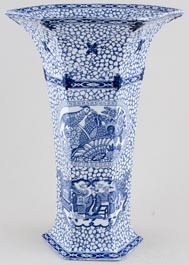 Octagonal vase in this lovely pattern with sheep, cows, donkey and a goat around the body with pretty floral border pattern around the inside and outside of the neck. Backstamp: Adams Cattle Scenery Ironstone England. Octagonal vase with bulbous base and gently flared rim. Excellent condition. Lovely rural scene around the body with wide floral border to the neck and cover. Backstamp: Impressed Adams Tunstall There is a little minor discolouration to the foot, discreet professional restoration to the neck and the cover, overall though an absolutely fabulous vase. 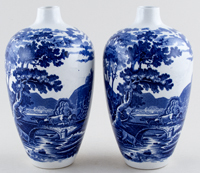 Lovely pair of vases with fabulous rural scene around the body. Backstamp: Adams Est 1657 W A & Co Cattle Scenery Ironstone. There is a little minor blue smudging here and there, one vase also has light crazing and the other a little minor wear around the neck rim and a small manufacturing fault on the side. Overall very good condition. Lovely rural scene around the body with wide floral border to the neck and cover. Backstamp: Impressed Adams Tunstall The cover has professional restoration to the rim otherwise excellent condition. A really lovely vase. 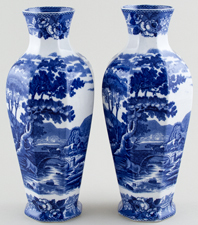 Pair of lovely octagonal vases with delightful floral border around the neck and rural scene around the body. Backstamp: Adams Est 1757 W A & Co Cattle Scenery Ironstone. Light crazing and one vase has a little minor discolouration to the foot overall excellent condition. Lovely pot with rural scene of cows, horses and sheep all around the body. Backstamp: Adams Cattle Scenery England. Some surface scratching inside to the base and a few blemishes around the body, overall excellent condition. Fabulous circular cache pot standing on three small feet with embossed detail around the body and decorated with a fabulous pattern of a horse, donkeys and of course cattle! No backstamp. There is a little surface scratching and small minor manufacturing fault inside. Elsewhere there is a little wear to the rim and feet and some blue smudging here and there. Overall excellent condition and a gorgeous piece. 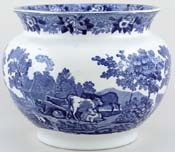 By Wm Adams & Co of Greengates Pottery, Tunstall in the dark blue version of their Cattle Scenery. The transfer is slightly blurred in one area and there are some superflous spots of blue. A few lines of crazing to the glaze and a minute rub on the rim, otherwise immaculate. Typical blue printed fancy backstamp. This is a delight! An hexagonal vase with Dog of Fo finial to the cover and fabulous rural scene around the body. Backstamp: Adams Est 1657 W A & Co Cattle Scenery Ironstone. Excellent condition. 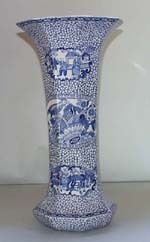 Delightful bulbous vase with cover in this lovely rural pattern with pretty floral border. There are one or two minor blemishes and a little wear to the inner rim of the cover otherwise in superb condition. This is a delight! 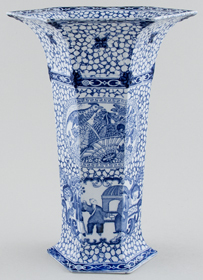 An hexagonal vase with Dog of Fo finial to the cover. Backstamp: Adams W A & Co Cattle Scenery Ironstone. There is a little pooling of the glaze around the neck and just a touch of roughness to the cover otherwise excellent condition. A fabulous very large covered vase printed in a light steely blue. Backstamp:Adams Est 1657 W A & Co Cattle Scenery Ironstone. The cover has a little damage around the rim and light crazing. The vase has a few lines of crazing otherwise is in excellent condition. 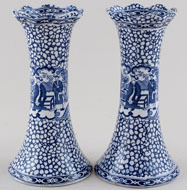 Pair of lovely octagonal vases with delightful floral border around the foot and neck and rural scene around the body. Backstamp: Adams Est 1757 W A & Co Cattle Scenery Ironstone. Light all over crazing otherwise excellent condition. This is an absolutely fabulous piece. Round body with gently flared rim. Main pattern around the body and floral decoration to the inside and outside of the rim. Backstamp: Adams est 1657 Cattle Scenery England. A little minor surface scratching and touch of discolouration inside and a firing fault underneath which does not affect the pot otherwise excellent condition. 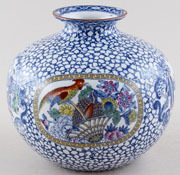 A very elegant octagonal vase, with the Chinese Bird one side and three Mandarins the other. Backstamp: Rd No. 623294 This Pattern was introduced by William Adams in 1780 being a copy of a Chinese pattern & one of the first of its style produced in English Pottery Wm Adams. There are a couple of small slithers of glaze off on one of the angles, directly on one of the Mandarins. It is difficult to be sure if it has had a knock at some point or whether it occurred during manufacture, but certainly not of recent occurence. Otherwise excellent condition. Backstamp: Rd No. 623294 This Pattern was introduced by William Adams in 1780 being a copy of a Chinese pattern & one of the first of its style produced in English Pottery Wm Adams England. A little very minor wear to the rim and a little discolouration inside otherwise excellent condition. Lovely cylindrical vase with gently flared rim. Backstamp: Rd No 623294 This Pattern was introduced by William Adams in 1780 being a copy of a Chinese pattern & one of the first of its style produced in English Pottery Wm Adams England. Pattern just a little patchy by the foot otherwise excellent condition. This is an extremely pretty vase with a gently flared wavy rim and standing on a splayed foot. Backstamp: Rd No. 623294 This Pattern was introduced by William Adams in 1780 being a copy of a Chinese pattern & one of the first of its style produced in English Pottery Wm Adams. Very pretty little vase with diamond piercing to rim. Backstamp: Rd No. 623294 This Pattern was introduced by William Adams in 1780 being a copy of a Chinese pattern & one of the first of its style produced in English Pottery Wm Adams. Light all over crazing otherwise excellent condition. Lovely round vase with gently flared rim to the neck. Backstamp: Rd No. 623294 This Pattern was introduced by William Adams in 1780 being a copy of a Chinese pattern & one of the first of its style produced in English Pottery. Wm Adams. Light all over crazing with a small hairline and a little wear to the rim. There is a little blurring of the pattern around the top and a little wear underneath, overall absolutely fine and the descriptions makes it sound much worse than it looks. Lovely octagonal vase with gently flared rim. Backstamp: Rd No. 623294 This Pattern was introduced by William Adams in 1780 being a copy of a Chinese pattern & one of the first of its style produced in English Pottery Wm Adams England. Inside there are a few minor blemishes, otherwise excellent condition. A very attractive vase with a gently flared wavy rim and standing on a splayed foot. Backstamp: Rd No. 623294 This Pattern was introduced by William Adams in 1780 being a copy of a Chinese pattern & one of the first of its style produced in English Pottery Wm Adams England. There is a little discolouration inside to the base and a little minor smudging of the pattern, otherwise excellent condition. Lovely round vase with gently flared rim to the neck. Backstamp: Rd No. 623294 This Pattern was introduced by William Adams in 1780 being a copy of a Chinese pattern & one of the first of its style produced in English Pottery. Wm Adams. Light all over crazing with a little wear underneath, otherwise excellent condition. Fabulous vase and cover with blue teardrop finial to the cover. Backstamp: Rd No. 623294 This Pattern was introduced by William Adams in 1780 being a copy of a Chinese pattern & one of the first of its style produced in English Pottery Wm Adams. Light all over crazing with discreet hairline to the neck otherwise excellent condition. 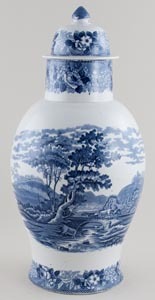 Fabulous vase and cover with blue teardrop finial to the cover. Backstamp: Rd No 623294 This Pattern was introduced by William Adams in 1780 being a copy of a Chinese pattern & one of the first of its style produced in English Pottery Wm Adams. Crazed otherwise excellent condition. 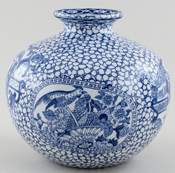 Fabulous vase and cover with blue teardrop finial to the cover. Backstamp: Rd No 623294 This Pattern was introduced by William Adams in 1780 being a copy of a Chinese pattern & one of the first of its style produced in English Pottery Wm Adams England. Some discolouration inside and underneath and just a touch of wear to the rim of the cover otherwise excellent condition. The cover is a slightly paler blue than the vase. Tall ovoid with a small bud neck rim. Usual blue printed backstamp, including reg. no. 623294 for 1913. Cylindrical vase with gently flared rim. Excellent condition. 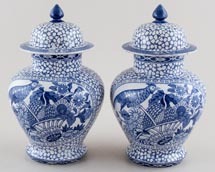 A fabulous pair of octagonal vases. Backstamp: Rd No. 623294 This Pattern was introduced by William Adams in 1780 being a copy of a Chinese pattern & one of the first of its style produced in English Pottery Wm Adams. Inside one vase there is a very small unglazed area which has discoloured slightly and a little blurring of the border pattern. Otherwise excellent condition. 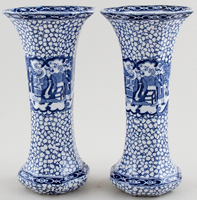 Two very attractive vases with a gently flared wavy rim and standing on a splayed feet. Backstamp: Rd No. 623294 This Pattern was introduced by William Adams in 1780 being a copy of a Chinese pattern & one of the first of its style produced in English Pottery Wm Adams. There is just a little thin glaze around the rim which makes the pattern slightly darker and one vase has light crazing. Overall excellent condition. A fabulous large hexagonal vase with embossed flower detail to the wide flared rim. Backstamp: Rd No. 623294 This Pattern was introduced by William Adams in 1780 being a copy of a Chinese pattern & one of the first of its style produced in English Pottery Wm Adams England. Excellent condition. 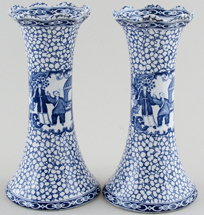 Wonderful pair of vases with pierced detail to the rim. Backstamp: Rd No. 623294 This Pattern was introduced by William Adams in 1780 being a copy of a Chinese pattern & one of the first of its style produced in English Pottery Wm Adams England. Excellent condition. This is an absolutely stunning vase, hexagonal with a gently flared rim. The flared rim has lovely embossed criss-cross and flower decoration. Backstamp:Rd No 623294 This Pattern was introduced by Williams Adams in 1780 being a copy of a Chinese pattern & one of the first of its style produced in English Pottery Wm Adams. A little minor blue smudging here and there, overall excellent condition. Tall ovoid vase with a small bud neck rim. Usual blue printed backstamp, with Registration Applied For, so an early example of this design. This is a lovely pair of vases in superb condition. This is a lovely vase, hexagonal with a gently flared rim. Two different cartouches either side with embossed decoration around the rim. Excellent condition. Pairs of vases are so difficult to find. These are in lovely condition with the faintest and shortest of hairlines to the rim of one of them. Bear the usual Rd No 623294 blue printed back stamp. Fabulous pair of vases. They have light all over crazing with a little thin glaze around the necks. One of the covers has a chip to the rim and the tip of the finial is just a little rubbed. 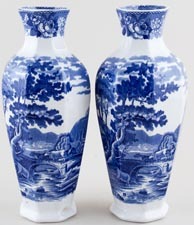 Overall a stunning pair of vases. This has to be one of the most unusual shaped vases we have come across. Stretched ovoid and standing on a splayed foot! Fine crazing but this is noticeable mainly from the inside. Usual blue printed backstamp. Stunning very large vase. Backstamp: Rd No. 623294 This Pattern was introduced by William Adams in 1780 being a copy of a Chinese pattern & one of the first of its style produced in English Pottery Wm Adams England. Gorgeous round vase with ochre rim and gently flared neck. Four pattern cartouches around the body, blue printed under the glaze with hand applied enamel colour. Backstamp: Rd No 625294 This Pattern was introduced by William Adams in 1780 being a copy of a Chinese pattern & one of the first of its style produced in English Pottery Wm Adams. Light crazing otherwise excellent condition. Lovely vase with ochre rim and the added delight of hand applied enamel colour. Just a touch of wear to the ochre rim otherwise superb condition. Beautiful round cache pot or jardiniere. This is the version with added colour and there is a pattern number painted on the bottom 5195. This is in lovely condition. A tiny nick to one foot and another to the rim, but miniscule. We wonder if one of the feet has been off and restuck, but if it has it came off cleanly and went back cleanly! Typical blue printed backstamp and impressed Adams Tunstall. With gilt. Very pretty vase with wavy rim. Backstamp: Regal Wm Adams Estabd 1657 Tunstall England. The gilt is very worn and there is a very small chip and a couple of tiny blemishes to the foot. Overall absolutely fine and a lovely piece. With gilt. Backstamp: Venice Adderleys Ltd Trade Mark England. An extremely pretty vase printed in a steely blue with ornate moulded detail to the wavy rim. Backstamp: Allertons England Iris. Light crazing otherwise excellent condition.